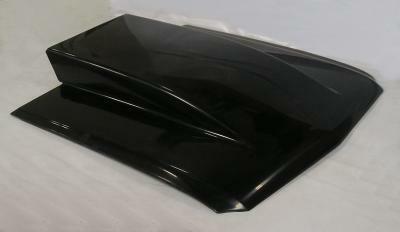 This stock replica hood features a full fiberglass inner structure for maximum strength. Small steel inserts are firmly molded in for easy mounting to original hinges. Molded edges assure perfect fit. Smooth top surface eliminates any body work or filling with body filler. Copy of Shelby-type hood. This hood features very smooth ripple free surface. Full inner structure is a replica of original inner frame, and gives full support to entire hood to eliminate any sagging or distortion. Bolts to hinges, pinned in front. Designed for extra clearance and racing applications, this hood features a full 5 inch extra clearance over stock flat hood. This hood also features full inner structure for proper strength. View of front latch area MU791, 65-66 Mustang 'Shelby Style' hood. Other front latch 1965 and 1966 Mustang hoods have the same rugged front latch system. UP22.com the web's giant-giant site for quality fiberglass. Customers agree, fit, price, quality all come together at UP22.com. Please visit UP22.com frequently to see updates, specials and new items. Or visit our factory in Hesperia CA. You can pick up items (call ahead) or just browse our huge factory. You can request to see our lay-up shop and see how our products are made! MU-516E Eleanor hood for 65-66 Mustang. Very close copy of gone in 60 style hood. This hood features very smooth ripple free surface. Full inner structure is a replica of original inner frame, and gives full support to entire hood to eliminate any sagging or distortion. Bolts to hinges, pinned in front. Scoop is open underneath for extra engine clearance, but no openings in front. Scoop actually starts at 16" from front (as measured in center). Fiberglass fenders are well suited for street or strip application. They can be easily mounted to original locations. For using original headlights we recommend purchasing MU-10 buckets. For fastback application only, this rear package tray replaces the rear seat. It features the standard flat design and has full indent for spare tire. These headlight buckets are necessary when mounting original headlights. They consist of the part behind the headlight only. A flange is provided to make mounting easy to original fender or a fiberglass replica. For maximum weight reduction fiberglass doors are the ultimate. Not recommended for street use. Original handles and latches plus original hinges can be installed. Lexan windows are recommended. Flares are designed for bonding to rear wheel openings. These flares allow use of wider wheel and tire. 3" extra width is provided over standard wheel opening. With the proper offset rims, you can use M50 tires (12"). Rolled lip around wheel opening pro-vides a nice finished look. Side scoops for 65-66 Mustangs. These scoops have internal flanges for easy mounting to the original body. Designed to be mounted to the rear quarter panel, just behind the doors on either side of the car. Mustang 65-66 fast back trunk lid, designed especially for drag racing, this light- weight version has molded edges to insure perfect fit. For hinge mount see MU113H. Install it yourself with just a few bolts. This hood/scoop combo is a real ease to assemble-MU100 stock flat hood and aero-top. Just bolt the scoop onto the hood in any position and you're done. Modernize in a snap and to get full function of scoop, you can easily cut a matching hole in the hood. 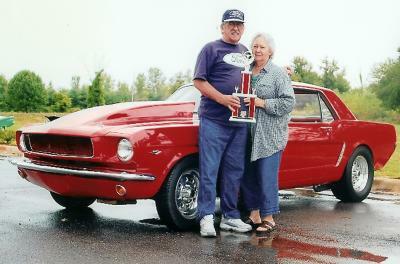 Front fiberglass bumper for 65-66 Mustangs. 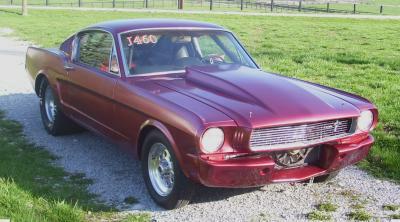 You can really cut down the front end weight and still retain the original stock look. Just bolt to your stock brackets and paint flat black or color match to the car. Fully hand-laid with quality materials for long life. Rear fiberglass bumper for retaining the stock look. You can easily mount this quality piece to your stock brackets or you can mount to fabricated brackets to further cut down weight. Light sanding is all that is necessary for proper painting. All bumpers feature crack resistant gelcoat surface, and are all hand-laid with the latest fiberglass techniques and materials. 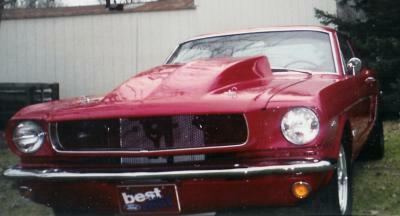 Front valance panel for 65-66 Mustang. Similar to original front pan. Features crack resistant gel-coat finish and fully hand laid fiberglass for dent protection. The filler panel behind the front bumper can be replaced with rust and dent resistant fiberglass. This piece is easily painted to match the color of the car and will bolt in the original locations. This R-Code apron features duct holes (holes have duct extension) for attaching 3" hose that can be directed toward brake discs for brake cooling. Center cutout is 22-1/2" wide. Ends have reverse flanges for mounting to front of fenders. Original bumper is not used with this racing apron. 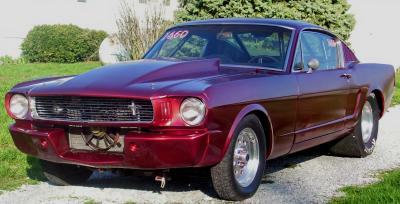 3-1/4" high cowl induction hood for 65-66 Mustang. Features smooth grey gel coat finish. Scoop top is smooth (no ridge). MU593 has provision for latching in the front like original. Both MU583 and MU593 mount to hinges in the rear. Bolts included with all hoods. Molded edges on all sides to insure a perfect fit.